I have been a ModCloth lover since my very first order back in 2010. Currently half of my wardrobe is from them. Their whimsical, quirky, romantic style is me to a T. If I could wear dresses every day of my life I would! 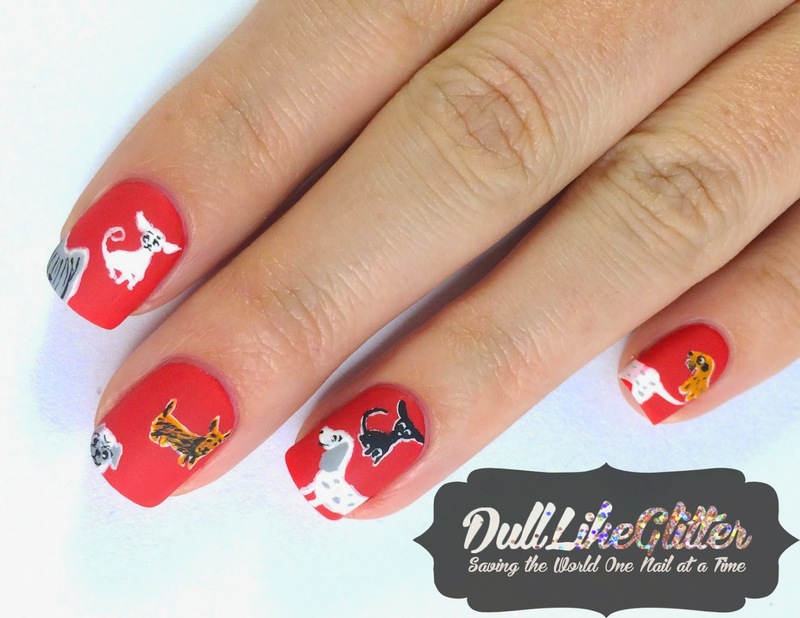 When I saw some posts by ModCloth's Nail Klub being created based of some of their fabulous frocks I knew I had to jump in. I went through a lot of summer dresses to find one that I thought would be perfect to pull a nail design from. When I saw the Graceful Greenery Dress in Dog Park it was calling to me! 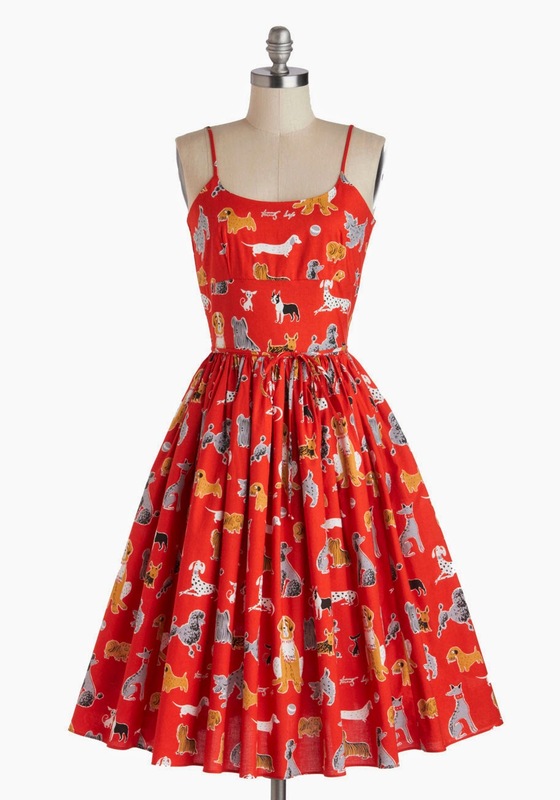 The print of this dress, by Bernie Dexter, is a beautiful crimson with vintage cartoon doggies everywhere. Upon further digging of this unique print I found out that it is by Tammis Keefe who worked in the Disney studios and was one of the first women back in the 40's and 50's to become well known and attributed to her commercial artwork. You can see her signature on parts of the dress. She produced around 400 designs for handkerchiefs and dishtowels all featuring her unique style during some of my favorite eras. 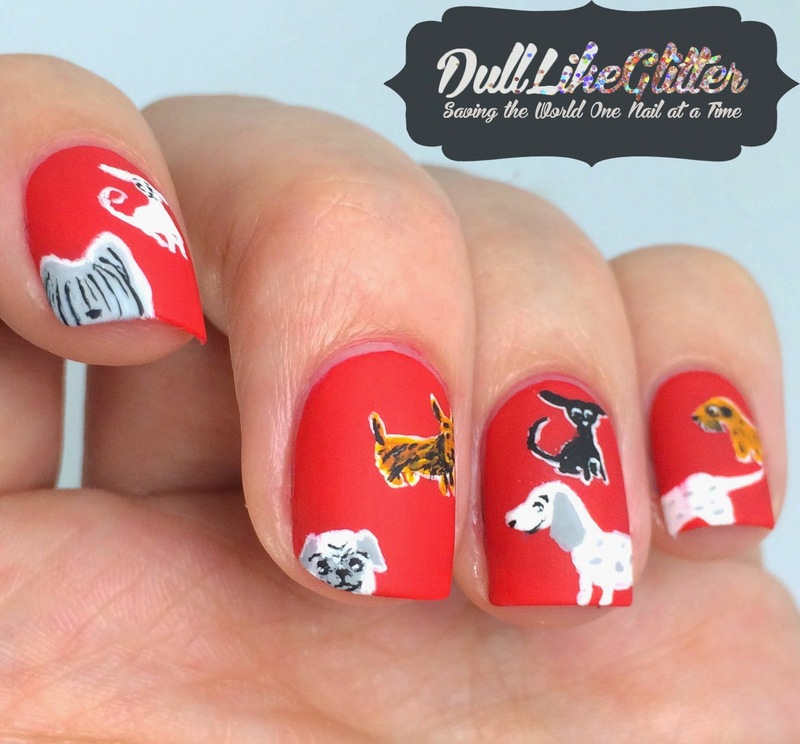 I went right to emulating the design on the dress by recreating some of the pooches featured. For the base I used Essie Snap Happy which, by the way is one of my absolute favorite formulas ever. 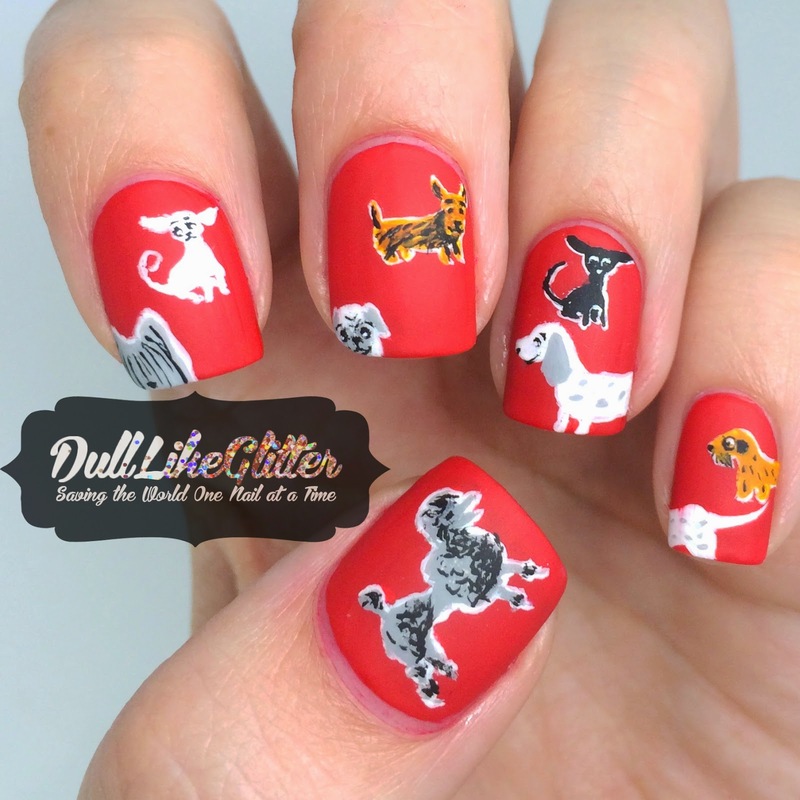 For the detail I hand painted white outlines of the dogs from poodles, to dachshunds to chihuahuas and then added accents of brown, grey and black for the details. Finishing the design off with a matte top coat from Butter London helped give these nails a cloth like appearance. 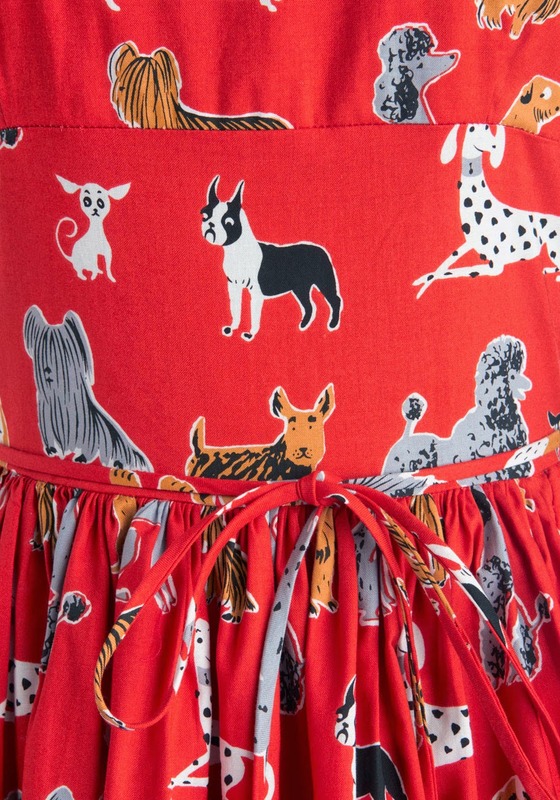 One little pup wasn't included on the print of the dress. It's Winston the spokes-pug, ModCloths mascot! Can you spot him peeking up on my middle nail? New to ModCloth? It's an amazing online store that carries vintage, vintage inspired and indie clothing and accessories. Get $15 off your first order of $50 or more when you sign up for a new account here. Omg that is not only adorable, but SKILLS girl! That looks amazing! 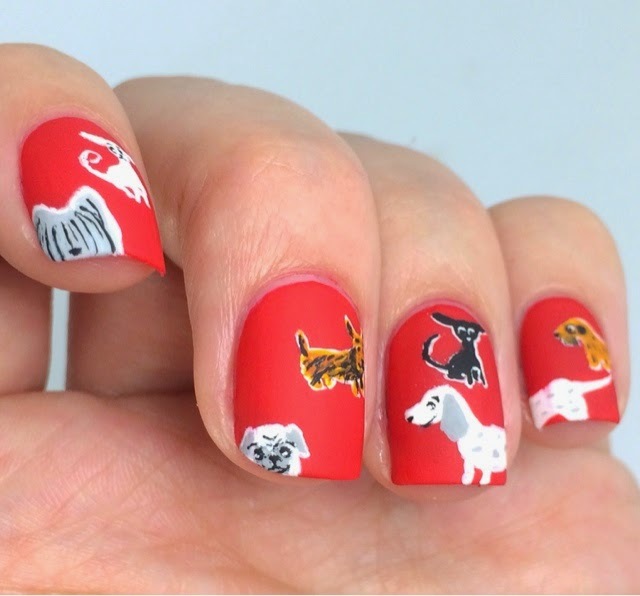 :) Best nail art I've seen to date! Could you also review Vain Pursuits? I'd love to hear what you have to say abt them! Agreed! I love this! 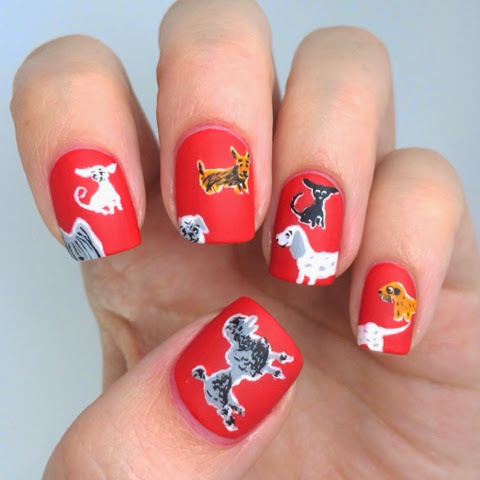 Wish my manicurist could do the same :-P I guess I'll have to learn on my own! I also just googled Vain Pursuits out of curiosity. They sound interesting!